Here We Go Again | Meet lexxiegray.com! Almost four years ago during the summer before my final year of college, I randomly decided to start a blog. I say randomly, but in all honesty, it was anything but. 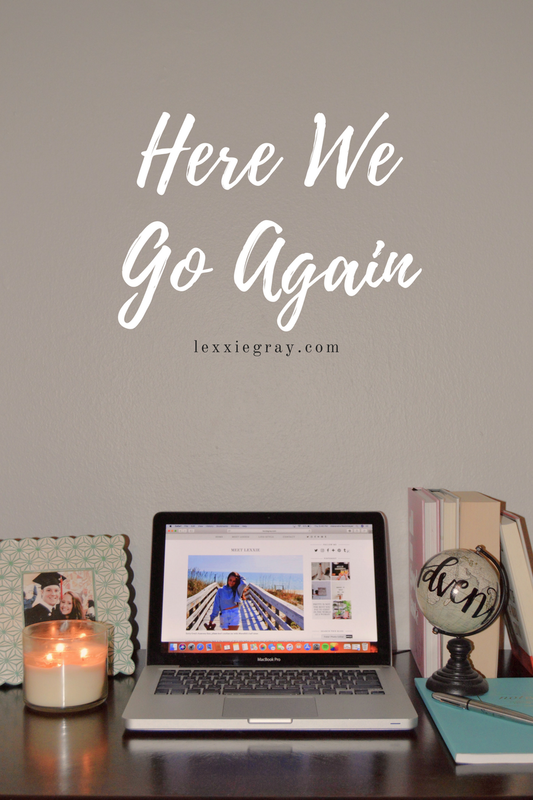 I had considered starting a blog on multiple occasions and that summer was finally the time I bit the bullet. It was a monumental moment for me. I grew up with barely an ounce of confidence to my name, something I still internally struggle with today, so putting my thoughts and work out on the web for people possibly beyond my friend group on Facebook to see was nerve-racking. But I did it and throughout my dedication to that blog, I found love for creative expression, confidence in a world that can offer plenty of judgment and a hobby in a time where life was about to get real. I had received great positivity and feedback during that time and I felt truly proud of myself for taking action on something I had wanted to do for a while. Ultimately though I gave up on it. I’m sure not many people noticed, but I sure did. The creativity wasn’t there, the motivation wasn’t there and I had the excuse that the time wasn’t there. I graduated from college, moved back to Cincinnati for my first job, juggled the ins and outs of a long distance relationship, dealt with many personal battles along the way and just simply got lazy. I now realize that it was the wrong time for me to give up on something I had barely started, while also giving up on something that was personal and a fun hobby during a period that I needed it most. But I did, I stopped blogging. Even though I blame timing for my sudden halt, as I began to get the bug for starting a new project and I reflected back on my past work, I realized that half of the time I wasn’t authentic. Reading most if not all of my earlier posts felt fake, forced and just not the person I consider myself today. You could tell I wasn’t trying, that I was comparing and that I wasn’t even attempting to be original. I think in my gut I knew that this wasn’t what I had originally intended to create. I wanted a space of reflection, creativity, passions, ideas and just plain fun. I know that’s not what I achieved and I’m not surprised that I gave it up. Life continued to speed up though and suddenly I was in a large new city, with new people, an awesome new job and a sudden spark that even though I wasn’t sure what it was then, I noticed it was something missing from me that was trying to make its return. I was nervous (okay I was terrified), but all I knew was that I didn’t want that spark to fade out again. I wanted to ignite it. But I’m sure as you can tell from where we are now, I didn’t let that happen. I was in this new chapter of my life, one I desperately wanted to thrive in. But I didn’t capture that motivation and I let it slip out of reach, unsure of what I wanted to do. Or maybe even needed to do for myself. So did you guess what happened next? Long story short, I packed up again. Moved to a new city and state again. Started over again. It wasn’t as easy this time though. I was leaving a place I felt I haven’t even begun to explore or even appreciate. I was leaving the greatest job for…. unemployment. I was about to attempt to build up residency in a city I had only been to once for maybe a few hours. There was absolutely everything working against me and yet, on Fourth of July weekend (probably the worst possible time to travel), I moved away from the bustling city of Atlanta to venture towards I don’t even know what in Tallahassee, Florida. People call me strong, I say I’m crazy. I’ll admit that the first few months were rough for more reasons than I could count on both hands. But coming into the new year, everything is seeming (knock on wood) to fall into a comfortable, but still challenging place. I love my new job, I love my new apartment (besides the multitude of plumbing issues that seem to keep popping up and that we could really use extra closet space), I feel secure with my relationships and most important I feel more secure within myself. It also isn’t too shabby that I live about an hour from the Florida coastline. I’ve accomplished a lot since the day I decided to start that blog. I also failed, made mistakes, threw myself into challenging situations and miraculously came out with only a few scars to show my journey. But through the good and ugly, as cheesy as this might sound, I grew up. I feel more like the version of me I was always supposed to become. I always joke that I was that girl who would never get her “glow-up”. I’m thinking mine just happened in a different way. I’m really excited to start this again. I have a lot of plans and ideas for 2018, ones I don’t want to fail. I owe this version of myself something as she definitely deserves it. The universe can be cruel when it needs to be. It always explains later though, when enough time has passed and you’re ready to hear it. It's so good to hear that things are going good for you in Florida! Especially that you're loving your new job and that you're in a better place (and mindset). I can't wait to see what else you have in store for us on your blog! Yay! Thanks girl for reading what I've been up to lately! I love how real this is!